Dishwashing liquid is liquid detergent. It is used for washing dishes. It is designed not to hurt people's skin while they are washing dishes. This liquid is useful for cleaning oil because dishwashing liquid reduces the surface tension of oil and, when washed with water, the oil can be washed away. It is also used to clean sea birds if they get covered in oil after a spill. The main chemical in dishwashing liquid is phosphate. ↑ "Dishwashing Detergent". epa.gov. 2012. Retrieved April 27, 2015. 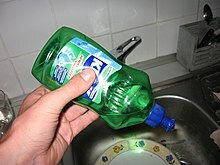 Wikimedia Commons has media related to Dishwashing liquid. This page was last changed on 27 April 2015, at 22:58.